Volunteer tour guides are needed to provide small-group tours to students, K-12, visiting the Museum with their school class. You don’t have to be a country music expert. Just bring your enthusiasm, and we will provide the training! The Museum is a nonprofit educational institution and depends on the generous gifts of time and talent provided by its volunteers. 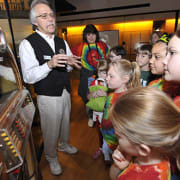 The Country Music Hall of Fame and Museum is a great place to volunteer with great volunteer benefits. Volunteer tour guides must enjoy working with youth, have excellent communications skills, and perform with a high degree of professionalism and commitment. Interview and successful completion of a background check are required.